One day resting against a narrow tree trunk, while sitting on the ground for hours in the Jamme' Forest, waiting for some mystical event to take place; as was not uncommon in this place, something that would perhaps further endow me with more keen insight into the complexities of life. After several more hours of undaunted patients in waiting, suddenly, in the distance far down the gravel covered road, a rather peculiar shape was slowly heading in my direction. This creature? It looked to be at least six feet tall, no arms, but had long tall legs like two long stilts that that just looked as though they simply jutted from the bottom of its body and ended with feet like nothing I've seen on any Michigan bird in my over fifty years of observing the many birds of Michigan. As the being seemed to be closing in on my direction, I started to slowly let my eyes drift down to the ground, I did not sense any danger of any kind, just thought to signal to the approaching being that I had no intentions of any kind. Looking down at the ground the shadow of this seven headed creature, being... person... was casting itself on the gravel path with all seven contorted shadows animating on the ground. The creature was standing right at my side; I could feel him staring at me, but I was I focused on it's ancient looking feet. 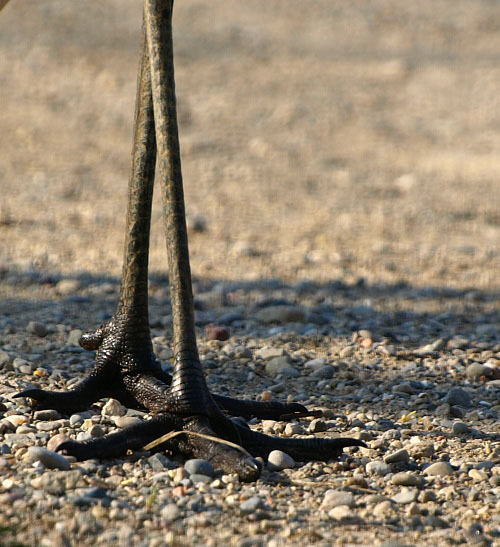 The feet appeared to be made of hundreds of leathery tiles of various sizes and shapes that snapped perfectly together to form a series of stilts for legs and elongated branches that made its toes. This thing must weighted a ton, because the earth reverberated and gravel vibrated with a thump as each metallic foot hit the ground. After quickly snapping a few more photographs of those shinny black armor covered looking feet, I decided to look up and make the acquaintance. What is your name? I asked. Should I tell you all seven names? Each name represents a part of our personality; we are all different, yet as you can see, we are also one person, and just one name can be a sentence long and one name does not define us all. So, I will tell you my name later, but first may I ask, tell me your other names Ike. Ike? wait a minute, how did you know my name was Ike? That is easy, every person carries their superficial name tag in the forefront of their mind. It is the other consciousness that I wish you to identify and introduce to me. I responded by saying, that my name is Ike and unlike you, I am only one person inside and out, not seven individual person like yourself sharing one body. That is where you are wrong. Now I know why the I was summoned to this path. You see Ike, early this morning I was headed off for a long journey and suddenly the soft voice of distant thundering requested that I turn around and land on the road just beneath. Without hesitation or second thought I reversed my direction and started my descent. I saw you sitting near the gravel path and decided to land a few feet down the road just to give you a chance to adjust to my presents and appearance. I have already heard of you and was really quite elated to make the acquaintance in person. Based on your response in my asking you your name and you giving me only your one superficial name, I know why the CloudHost wanted us to meet. What you see in my appearance on the outside, you are on the inside. You mean, I have seven different persons all living in one body? Hum, that might answer some of the strange things that I experienced over my life time; like when I doze off, there is this "other reality" that's what I call it, that is playing out. This reality seems just as real as my present physical reality and is instantly disrupted the moment I become self ware that I'm seeing something in another world or dimension. I can't hold on to the vision or dream, it just ends and I'm back here in my physical mind. It is not uncommon for me to have an up close face to face look at one of the persons during this experience and it is me. These are not dreams, these are your other persons. They all have gone in different paths; you are disconnected because you have not addressed them and became one with yourself. So, until you can identify each and give them a name or get their names based on there personality they will remain on the outskirts of your consciousness as strangers in a dream. As you and I are speaking directly to one another, have you noticed that my other counter parts are engaged with you also? Well not you directly, but someone else inside your concourses? Yes. I kept looking behind me to see what it is your other six heads are looking at. They are looking at your other persons. This is going to be difficult. It is not easy to still the soul enough to become aware of one's own inner soul for extended periods of time. To add to the complexity, it is even harder because one's emotions must be under total control and rendered disabled during contact between any two inner persons. Each inner person has a unique perspective to offer. With full acquaintance, your will soar through life as I soar through the skies. Life is for exploration, not to bring insult or to become a slave to any physical thing or one place. If you can start to listen to those seemingly other voices that often time you think is just your own mind, you will began to make the acquaintance, But, be aware that they are like you, if you are ignored you can get spiteful and never give a person your full attention, all of your inner persons carry those same human traits that you do. They, just like you, do not know that other persons exist at this point. So you will have to find a way to have an inner "call-to-action" or inner-class to invite all those present to make themselves known, this is your first complicated step of many more to come. Be alert for something as simple as unknown never before heard songs that appear inside your head, if something of this nature occurs repeatedly, you may have already witnessed one of your other conscious persons. Initiate further dialog by providing your undivided attention for the next several days and observe how the simple, build upon simple concepts, then can evolve to the most complex. But, become distracted and turn your attention elsewhere during this precious opportunity and your number two person will do likewise. Each inner-person is really several unique characteristics of the individual. They are only realized after years of observation, mastery and discipline. For instance, one may notice that after a rigorous study period particularly of meaningful or moral learning material, the following nights may accompany dreams of thievery of your vehicle being stolen. That is your inner-self prodding you to stay infinitely alert. But, just this one example could take 50 years to for you to first notice a pattern, make a connection, draw an accurate conclusion and eventually figure out. There is a lot more lessons to be learned from this example, but just thought I would provide enough of what you are not learning about real life. Without me telling you this, you like many, will waste an entire lifetime pursuing re-defined physical money only to discover that there are different interpretations of money or things of value. Is money American dollars, Italian lira, blocks of gold or is it an abundance of children, eye-sight, good health? Would a blind man not trade all his money for eye-sight or would you not trade all your money for good health? To become all you can be, one must first... "know yourself!" or should I say... discover yourself... this is valuable, do not live your life as an "undiscovered person." Because if one has all knowledge, one does not need money, because through the 4 Disciplines as I learned many years ago, from the Ancient Tree Griot in the northern Jimme' Forest, one can make or attain everything they wish to acquire given they have FIRST mastered the discipline of focus and inner unison. Would it not not be insanity to see a bird walking to work, beg for money, purchase a ticket to fly on a plane? If you see such, you will understand that this bird has lost itself, this bird has no knowledge of it's capabilities, such is an "undiscovered man." Man is more than a gold chasing slave to waste his whole life in the pursuit to get what he has been told was money. Sadly, without any doubting, he has accepted the biggest distraction of false-hood and therefore by-passed the opportunity to discover his true potential. Whole nations, for thousands of years have bred themselves into birds without wings, hence the term from Grandma of old Tree Griots... man is the fallen, walking, talking complaining gaggle of birds the whole universe come to see. Does any of this make any since? ...you will be able to travel with me to far away places. I will return in seven thousand years to see how you all have progressed. Start with memorization and emotional control. Next, simontaneously, observe patterns in life as they influence dreams, mapping your inner-minds are only the beginning. I must take to flight now. Extended conversation with you, jeopordizes my own pursiut to master flight. Before you go, what is your name or names? According to your current level of inner-self intellect, today my name is... simply one of seven. and then he, they, disappeared into the base of the mile-wide sky-long cumulus cloud formation above. Appearance: The Sandhill Crane is a tall 4'-6' tall grayish, brownish plumage, long skinny legs, and long bills. Flight Characteristics: Extended necks in flight and typically ride thermal drafts similar to large raptors. SandHill Cranes will glide on a series of thermal rises until they reach their intended destination. Habitat: The SandHill crane prefers open grasslands and wetlands. Nesting: SandHills will construct a rather large mounded nests made of grass and leaves. Incubates 2 eggs for appx 29-32 days. Younglings go in flight in about 50 days from days of birth. Mating Habits: The SandHill Crane mates for life.